This Persistence Market Research (PMR) report examines the global scar treatment market for the period 2017–2025. The primary objective of the report is to offer insights into the developments in the scar treatment market that are moderately transforming the outlook of global businesses and enterprises in the related domain. The scar treatment market report begins with an overview of the scar treatment process and analysis of the various types of scars and their probable treatments. This section includes identifying the key features of scars and the respective considerations for appropriate commercial sizing of the market. The following section underlines factors influencing growth of the scar treatment market currently, along with details of the key trends, drivers, restraints, opportunities, regulations, reimbursement scenarios, and an analysis of the impact expected to be created by each of the drivers and restraints over the forecast period. Impact analysis of the key regional growth drivers and restraints has been assessed based on the weighted average factor model along with key region-specific trends. This has been included in the market report to better equip clients with information and hidden insights. At the end of the report, PMR has included an exclusive section on competitive landscape for players who plan to foray deeper into the existing market. The section highlights key upcoming requirements for companies to better capture higher market share and emerge profitable over the long term. The global scar treatment market is analysed based on product-type, scar type, end-user (distribution channel), and regions. Based on product type, the overall market has been segmented into topical products, laser products, surface treatment products, and injectable products. The topical product segment is further segmented into creams, gels, oils, and silicone gel sheets. The laser segment has been sub-segmented into CO2, excimer, and pulse-dyed lasers. Based on scar type, the market has been sub-segmented into atrophic scars, hypertrophic scars and keloids, contractures, and stretch marks. A detailed analysis of every segment and sub-segment in terms of market size, Y-o-Y growth rate and market attractive index has been provided along with appropriate rationale for better understanding the market. The next section of the report highlights the growth trends witnessed in the scar treatment market, by region. It provides a market outlook for 2017–2025 and sets the forecast within the context of the scar treatment market. The study discusses key regional trends contributing to growth of the scar treatment market worldwide, as well as analyses the extent to which the corresponding drivers are influencing this market in each region, currently. Analysis based on product-type, scar type, end-user (distribution channel), and region helps in evaluating the present scenario and growth prospects of the scar treatment market for the period 2017 –2025, in a holistic manner. We have considered 2016 as the base year and 2017 as the estimated year as some of the associated companies have not published their current financials. In the final section of the report, competitive information related to the scar treatment market has been included to provide companies with insights required to enter or deepen revenue from a specific segment. This could help these companies in strengthening their revenue footprints in the scar treatment market and also to differentiate themselves. Key categories of providers covered in the report are scar treatment product manufacturers. Detailed company profiles have been primarily designed to provide clients with an objective and detailed comparative assessment of key providers specific to a key market segment in the scar treatment value chain. Report audiences can gain segment-specific vendor insights to identify and evaluate key competitors based on the in-depth assessment of their capabilities and success in the scar treatment marketplace. To ascertain the scar treatment market size, we have also considered key parameters that should be considered while judging product uptake through various distribution channels. The forecast presented here assesses the total revenue generated, by value, across the scar treatment market. In order to offer an accurate forecast, we started by sizing the current market, which forms the basis of how the scar treatment market is expected to develop in the future. Given the characteristics of the market, we triangulated the outcome on the basis of three different types of analysis, based on supply side, downstream industry demand, and the economic envelope. In addition, it is imperative to note that in an ever-fluctuating global economy, we not only conduct forecasts in terms of CAGR, but also analyse based on key parameters, such as Year-on-Year (Y-o-Y) growth rates, to understand the predictability of the market and to identify the right opportunities in the scar treatment market. To understand key growth areas of scar treatment in the near future, Persistence Market Research developed the scar treatment market’s ‘Attractiveness Index’, which has been provided for all the four categories, namely product type, scar type, end users, and regions. The resulting index and related rationale is expected to help providers identify the real market opportunities. The global scar treatment market has been analyzed to gain an understanding about the changing scenario of the appearance and aesthetic corrective procedures. Scar revision is a procedure that is used to minimize the scars in a way that they appear more consistent with the surrounding skin tone and texture. Scars are visible signs that remain after a wound heals. They are unavoidable results of an injury or a surgery and their development can be unpredictable. Scars may be raised or recessed, different in color or texture from the surrounding healthy tissue, or particularly noticeable due to their size, shape, or location. The market has been segmented by product type, scar type, end-users, and by geographical regions. The global scar treatment market is valued at US$ 9654.6 Mn in 2017 and is projected to expand at a robust CAGR of 7.6% over the forecast period of 2017–2025 to reach a valuation of more than US$ 13 Bn by the end of the forecasted year. Growth in revenue generated from the sales of scar treatment products and services is directly attributed to the increasing economic growth and rising personal disposable income levels at a global level. While treatment of burned scars and keloids is considered to be medically necessary by regulatory bodies, treatment of spot correction, mild-to-medium acne is not deemed as a medical necessity. Rise in affluent population has also been responsible for further fuelling the demand for aesthetic corrective procedures such as volume restoration, dermal filling, laser treatments, and wrinkle reduction. Hyaluronic acid based dermal fillers and botulinum type-A injections are prime examples of the same. Markets across the world are also witnessing growth in demand for combination therapeutics in scar treatments, with a view to increase effectiveness of the procedure and shorten the treatment duration. International regulatory benchmarking for uniform treatment guidelines and shortening of approval times are trends expected to prevail in the industry over the forecast period. This is expected to be accompanied with standardized documentation of clinical evidences of various combination therapeutics related to pharmacovigilance activities. Based on product type, the overall market has been segmented into topical products, laser products, surface treatment products, and injectable products. The topical product segment is further sub-segmented into creams, gels, oils, and silicone gel sheets. The laser segment has been sub-segmented into CO2, excimer, and pulse-dyed lasers. Within the topical segment, the silicone gel products are expected to witness increased adoption. While silicone gel sheets could find increased application for treating hypertrophic scars and keloids, silicone gels could be used to treat acne. Brand positioning among reputed end-users is a typical marketing strategy being adopted by product manufacturers. Existing brand loyalty among physicians and pharmacists makes it difficult for new entrants to penetrate this market. In this regard, the ‘silicone gel sheet’ sub-segment has been estimated to be valued at US$ 2,552.1 Mn by the end of 2025, registering a significant CAGR over the forecast period. Based on scar type, the market has been segmented into atrophic scars, hypertrophic scars and keloids, contractures, and stretch marks. Out of these four scar types, acne is the most common. Treatments for acne include a broad range of products, right from antibiotics to fractional CO2 lasers. Atrophic scar segment has been estimated to be valued at US$ 6,666.8 Mn by the end of 2025. Incidences of acne are estimated to increase over the forecast period due to changing lifestyles, increased consumption of frozen fatty food items, and early onset of ageing at a global level. 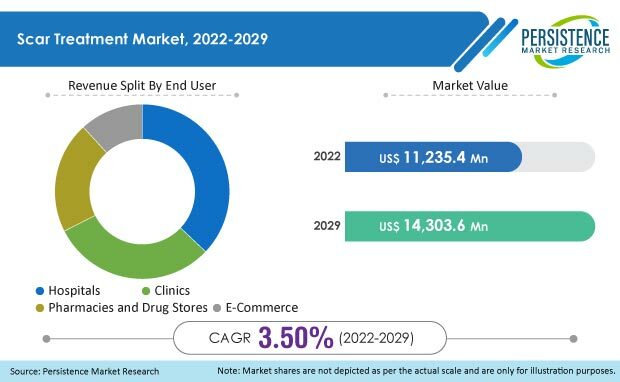 Based on end user, the global scar treatment market has been segmented into hospitals, clinics, pharmacies and retail drug stores, and e-commerce. Hospitals are clearly the most availed option by patients worldwide. However, treatment through specialist dermatologists at private clinics is a trend picking up steam in Brazil and Australia. The clinics segment is expected to be valued at US$ 4,007.7 Mn by 2025 end, registering a significant CAGR over the forecast period. The global scar treatment market has been segmented into five major regions, namely North America, Latin America, Europe, Asia Pacific, and the Middle East & Africa. In terms of value, North America market is estimated to be a dominant market, accounting for over one-third of the total scar treatment market value by 2016 end. It accounted for the largest market share and was valued at US$ 3355.3 Mn in 2016, and is expected to expand at a CAGR of 4.0% over the forecast period. Asia Pacific is estimated to emerge as the fastest growing market among all the emerging regions, while revenue from the market in Europe is expected to expand at a healthy CAGR of 4.0% over the forecast period despite the ongoing economic downturn in the region. During the 2017-2025 timeline, the growth in Europe is expected to be fuelled by the rapidly ageing population across all countries in the region.